Indonesia, fires off a shot. Which childhood pastime turns out to be good for your heart and your head? Ping-Pong, of course. I rediscovered the game of Ping-Pong five years ago on a cruise ship visiting ports of call in the South China Sea. On the last day aboard, I wandered into the ship's gym, where I beheld a sagging net and a paddle - a nostalgic sight. Corralling a crew member, I swatted and slammed, lurched and slid, giggled and missed and was struck by a revelation. Missing from my bookish, workaholic life for 30 years were the absolute joy and great waves of laughter that accompany the silly and serious act of batting a featherweight sphere across a table. When I returned to New York, I looked up "Ping-Pong" in the Yellow Pages and found nada. "Table Tennis" - also nada. I struck gold under "Billiards." In the small print of a display ad for a pool hall and billiards parlor, I read the words "TABLE TENNIS/PROFESSIONAL COACHING". "Are the coaches for pool or for Ping-Pong?" I asked on the phone. "For Ping-Pong, of course," came the gruff reply. That's how I found the world of competitive table tennis, began taking lessons from top-rated stars on the professional circuit, joined an amateurs' league and became a three nights-a-week player. The pros have a saying, "Ping-Pong is the game, table tennis is the sport." I still call it Ping-Pong, and it's the only exercise system I've ever tried that didn't bore me to death in six months. Dr. Steven Horowitz made precisely the same point when I asked him about the sport's aerobic benefits for aging hearts, minds and bodies. "More exciting than a treadmill!" he exclaimed. "It's no boring workout. You stay alert when competition and scores are involved." Horowitz, 53, is chief, division of cardiology, at the Heart Institute of Manhattan's Beth Israel Medical Center, and a serious tournament player who converted his suburban garage into a full-size court. "If you're playing the game right," he went on, "you're not using just eye-hand coordination. You're using your legs, arms and shoulders, so you're enhancing both speed and strength. Since you can't predict where your opponent's ball will drop, you force yourself to focus and prepare your body to move in any direction." Horowitz cross trains at a gym to strengthen his legs. "I tell myself it's for Ping-Pong," he says, "but it's all tied in with health." Another player, one of his cardiac patients, practices yoga to keep limber and flexible for the game. I just do Ping-Pong, and swear that the creaky stiffness I was beginning to feel in my spine has vanished. Ping-Pong entered the Olympics in 1988. It's huge in Europe and Asia, where the national championships are televised in prime time and most cities have leagues for all levels and ages of player. It's big in surprising places like Nigeria, Israel and the Caribbean, too. In fact, it's among the most popular recreational sports nearly everywhere except the United States. In this country Ping-Pong still suffers from a reputation as a fool-around game for teenagers in the family's basement, a rainy day activity we adored in summer camp or a fun thing we once did on dates, like miniature golf or bowling. 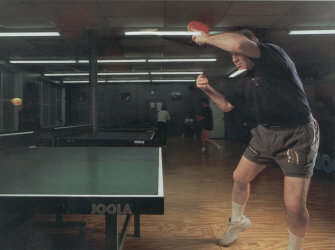 Dr. Steven Horowitz, a cardiologist, gets his heart pumping at the Manhattan Table Tennis Club in New York. Thanks to the Internet, things are changing. You can find a club close to home, or anywhere you travel, with a couple of clicks on your browser. You can reacquaint yourself with the rules and purchase gear online too, so you'll have a competitive edge on your friends and look cool and snappy. Yes, there is specialized gear for table tennis beyond a plain T-shirt and shorts. Lightweight sneakers are good; imported shoes made especially for the .tame are better. A custom-made paddle, also known as a bat or a racket, can cost as much as 5100, and you might want a paddle cover to keep it protected. If you haven't played in Nears, you'll be surprised to learn that a glued-on laver of spongy rubber has replaced the pimpled hard rubber or sandpaper of your youth. My friend Ethan, who just turned 60, growled when I told him his trusty old sandpaper bat was passé and also, since the mid-1930s, illegal in tournament competition. The spongy skins on the modern bat grip the ball to advantage in a sport that today is mostly spin: under spin, back spin, side spin and especially the awesome varieties of top spin-forehand, backhand and loop, a forward-driving, full-body shot that requires coordinated strength and a good racket. Are you dreaming of the nondescript, little white ball of your childhood? Wake up". Bright orange is today's hot color. Here's a bigger surprise: As of last year, by a nearly unanimous vote of the International Table Tennis Federation, the standard ball is 40 millimeters in diameter and weighs 2.71 grams. That makes it 2 millimeters larger and .2 grams heavier than the old ball. The "big" ball slows the game down by almost 20 percent, according to the experts. Rat-a-tat-tat machine gun returns, a la the famous, faked sequence in Forrest Gump, were making the rallies too fast and too short for spectators to follow in top-level play. Spin is easier to read on the big ball, too, an important plus for me because I wear glasses. "I love the big ball", raves Dan Seemiller, 46, of South Bend, Indiana. "It felt totally natural after one week, like, hey, this is what the ball was always supposed to be." Seemiller, a five-time U.S. Men's Singles champion, coached the L'.S. Men's Team at the Sydney Olympics and runs table camps in South Bend during the summer and between Christmas and the New Year. After a year of lessons in my hometown, I drummed up the nerve to join a women's league that plays on Sundays. I was expecting a bunch of jocks who'd destroy me. Not so. Catharina Tjiook, 52, a graphic design artist and a former Ping-Pong champion from Indonesia, started the league to encourage amateurs and beginners to enjoy her favorite sport. Two dozen of us, including a couple of over-60s, compete in singles and doubles matches from October to May, when Catharina ceremoniously hands out trophies to the divisional winners. I've bagged a few trophies for second and third place in Intermediate Doubles, mostly because my team captain, Maria Gobris, a 43-year-old social worker, is one of our league's best athletes. To use Catharina's expression. I am not yet "match tough." I tend to tense up under pressure, a familiar phenomenon to sports psychologists and athletes. Nobody would deny that I'm match tough in life; the art of staving physically relaxed yet totally focused in sport is something I'm learning. Advanced players prefer to compete I in official tournaments sanctioned by the U.S. Association of Table Tennis, where wins and losses determine ratings and rankings. Tournaments are held in local clubs around the country, with divisions for players over 40, over 50, over 60, etc. At this point, I don't intend to carry my enthusiasm, or should I say my ambition, that far. The main problem for amateurs and professionals alike is the shortage of high-ceilinged, well-lit public venues with straight wood floors and ample space between tables. In a positive sign that the sport may be about to boom, players in several cities are forming cooperative associations. Members lease their own space, run things on a volunteer basis, solicit private donations and offset their costs with monthly dues and small fees for walk-ins. What's particularly great about these clubs is the mix of ages and nationalities you'll find there. Set up a Ping-Pong club and you'll attract what '60s radicals optimistically used to call a "rainbow coalition." Tired of leading a transient existence between a church gym and a country-and-western dance hall, enthusiasts in Austin, Texas. recently bought and renovated an old warehouse, installed 10 tables and furnished a lounge area with couches, a TV and a refrigerator. "We all pitched in and helped out," says club member Richard Howell, 53, an oil-and-gas researcher who plays three nights a week. Howell admits that Austinites envy Houston's club, open seven days a week with 24 courts, an equipment shop and resident pros. A state-of-the-art club in San Diego, located in Balboa Park near the zoo, has a domed ceiling, a raised platform for tournaments and 20 tables. The Marvland Table Tennis Center in Gaithersburg, known for its junior champions, has two full-time coaches, Chinese émigrés Cheng Yinghua and Jack Huang, who are among the highest rated players in the country. Last summer, 70-year-old leery Wartski, who is in real estate, opened the Manhattan Table Tennis Club (6 tables, two flights up on Broadway) "because I wanted a place where I could play day and night," he says matter-of-factly. Top-rated pro Atanda Musa from Nigeria runs the place and is one of four coaches available for lessons. I was one of the first to take out a $65 monthly membership. Richard Howell was aghast when 1 told him walk-ins pay $6 an hour; in Austin, they play all night for $5. Whatever it costs, table tennis is cheaper than a gym membership or workouts with a personal trainer. "Another of its beauties," says Horowitz, the cardiologist, "is that beginners can start by using just their hand and wrist because the ball and racket are so light. When they learn to play better and work up a sweat, it gets more aerobic, and they will get better if they keep playing. Not only is this great exercise for the famous extra ten pounds that everyone wants to lose, it's fun to compete with a younger crowd and a joy to beat someone half your age." I'll second that. I regularly beat players half my age, and I did knock off that extra 10 pounds. Copyright © 2001 CT Table Tennis Assoc. All rights reserved.